This was a gift and they loved it. Still using it! Boast the sophistication of your ensemble when wearing this Michael Kors women's two-tone chronograph watch on your wrist. The elegant watch features cubic zirconias and a clear bezel that gleams with just a hint of light. Pair a casual outfit or a formal gown with the two-tone stainless steel colors, silver dial and stone accents of this exquisite accessory. Opt for quality when investing in the Michael Kors brand. This reliable watch not only gleams with the stone accents, but it also offers a practical solution to keep you on task. The hands display hour, minute, chronograph and seconds, complete with an hour totalizer, so you can organize your time wisely. I've been eyeing this watch in department stores for a while. I just didn't think it was worth $*. I'm glad I came across Overstock! Great price and genuine product! This watch does run large so I'll just have a few links taken out. This watch is heavy in weight. This Parker is stunning to the eye! It arrived fast and in original Michael Kors packaging/box with tags attached. Thanks Overstock for making my first Michael Kors Watch experience great!!!! The watch is as great as I thought it would be! I love the two-tone as it matches all of my other jewelry. This is a watch that can be dressed up or down, worn to work or a night out. Had three links taken out but I would have had to do that with any watch with this type of band. Definitely a good investment. I'll wear it for years to come. Another stunning watch I am glad I purchased, of course not for me but as a gift again. A simple watch that can be worn on a daily basis. The two tone is good for either your silver/gold jewelry you choose to wear. I have been eyeing this watch for a few months. I am an avid Overstock fan and when I saw this watch, I had to have it. Thank you Overstock for continuing to deliver great quality brands at great prices! This is the perfect everyday watch as it is two tone and pretty much goes with anything. I wear it with dresses or jeans and it looks amazing. This is my second Michael Kors watch from Overstock. Very pleased and could not match his price anywhere. I highly recommend it . This is an elegant watch , great size for ladies hands. I have had this watch for a little bit over a year now, and I wear this watch almost all the time when I'm out. This watch is very comfortable, charming, and reliable watch. I would definitely recommend this. The watch is gorgeous, as described came in original box but looks like it was already sized and it just barely fit my wrist, usually they come bigger for each customer to size it to their wrist measurement but this one just made it on y writs, other than that the watch it's beautiful and as described. 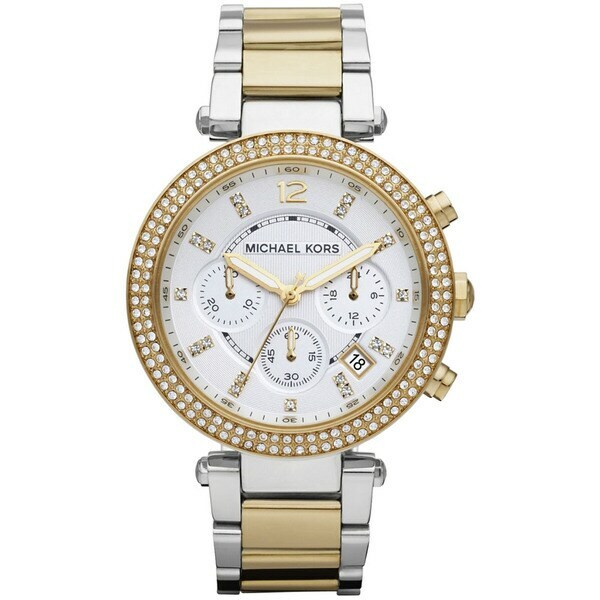 Gorgeous watch and our daughter loves MK!!! She's however willing to put up with the plating coming off as it did in her last all gold plated watch. I've suggested another brand to her that I actually collect and never had ANY plating issues. She wants the name. So it's very nice and she's willing to accept the fact that after a year or less of daily wear in her case ,,,, the thin plating will come off. The style and movement are very nice however!!! exact what i expect for overstock !! come with box and papers..........thank you for fast shipping .. Very classy and luxurious looking! It shines without trying and I get compliments on it often. And let's not forget the afforable pricng. Very happy with my purchase! The wife loves this watch, loves the weight of this watch. Keeps accurate time and isn’t fading. It’s just a classy piece and still to the day she still gets compliments. Wear it daily. Love it. I do recommend this item! Gave this to my daughter as a graduation gift. She loves it! Because it is manufactured by Fossil and is very pretty looking watch. Because it was an amazing deal for a stunning watch! I could not pass it up. "How could I take extra links out of this watch after I buy it?" Hello thenamesmaria, this lovely item is recommended to have a jeweler remove the links for you. Thank you for shopping with us. "how do I find out the model year?" Hello mrg12345, thank you for your inquiry. Unfortunately, the information you have requested is currently unavailable. We will continue to try and answer this for you. You will receive an email notification once an answer is posted. Have a great day.